Since the two plays I recently finished were in the same collection, I will review them both in the same post. Note: While the name of the characters are the same in the last three plays I’ve read, the characters play different roles in each of the plays. So, the beginning of one play does not spoil the ending of another play. A prince and his servants try to break up the relationship between Silvia and Arlequin. The prince wants to marry Silvia, but she is just too devoted to Arlequin. Unfortunately, bribery does not work because neither of the two cares for courtly life. It’s all flattery and hypocrisy. Still, the prince tries his best to deceive the lovers. 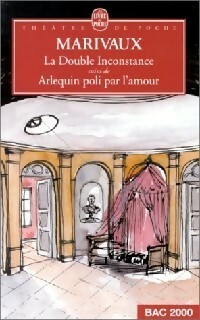 Double Inconstancy is a slapstick comedy about love and fidelity. While the comedy is less complex than in A Game of Love and Chance, it’s more immediate. Arlequin carries a baton, which he uses to strike at the prince’s servants. This must be the first slapstick comedy I have ever read, so I was initially horrified by Arlequin’s actions. We are conditioned to find abuse in comedy off-putting, especially in domestic comedies. That’s understandable, and probably good. But I quickly overcame my horror, and began to appreciate Arlequin’s witticisms. While I preferred A Game of Love and Chance, Double Inconstancy was still quite clever. A fairy kidnaps Arlequin while he’s sleeping the woods. But he seems completely oblivious to his kidnapping. The fairy tries to force him to love her, but Arlequin is only concerned about food. The wizard Merlin is already engaged to be married to the fairy, but the fairy does not care about her own reputation. She will get Arlequin to love her by hook or by crook. Harlequin Polished by Love is one of the magical slapstick comedies in Marivaux’s Commedia dell’arte – inspired repertoire. In comparison to the two previous plays I read, Harlequin Polished by Love is the least complex, but it is highly entertaining for a one-act play. I would love to see a performance of this play. Fairies, goblins, and a magic ring make this a very engrossing comedy. I’m sure the stage design would be more elaborate. Arlequin is also the most ridiculous in this play. This may be my favorite Marivaux play so far. Sylvia is betrothed to a man whom she fears may be a hypocrite like other men. She She knows women who are married to men who pretend to be virtuous in public but are abusive at home. With her father Monsieur Orgon’s approval, Sylvia disguises herself as her servant Lisette to put her suitor Doronte to the test. Lisette disguises herself as her mistress. But what Sylvia and Lisette don’t know is that Doronte has had the same idea. He too has decided to disguise himself as his servant. Doronte’s valet Arlequin now has the difficult task of passing as his master. Only Monsieur Orgon and Sylvia’s brother Mario know the truth. Each party in the drama does not know that the other is pretending to be someone else. 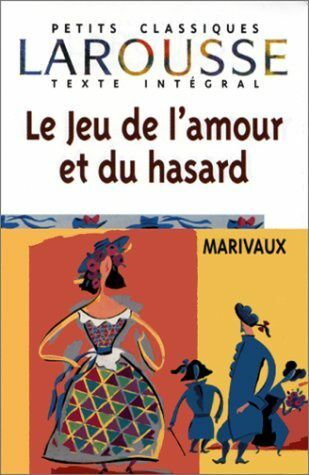 Le jeu de l’amour et du hasard by Marivaux (1688-1763) is a comedy that explores the role of social class in love. I first heard about this play through the French film L’Esquive. The teenagers in the film were performing Marivaux’s play in school. Their own personal struggles mirrored that of the characters in the play. I’m interested in social class, so I was immediately excited to read Le jeu de l’amour et du hasard. While I enjoyed the play, it was quite challenging to read. Whenever Sylvia was speaking I had to tell myself that she was disguised as Lisette. Lisette disguised as Sylvia might be speaking to Arlequin disguised as Lisette, but the play merely said that Lisette was speaking to Arlequin. I had to fill in the rest in my mind. It was even more challenging when there were three characters in a scene. I found a performance of the play on YouTube. The performance is much easier to follow than the book. Still, I do not regret reading the play. It is brilliantly constructed. It is not only an exploration of social class but also a commentary on performance in general. The audience of the play knows that it is watching a performance, but do we realize that we are acting in our everyday lives? Sylvia and Doronte insist that people wear masks in public to hide their true selves. Everyone knows subconsciously that the whole world is a stage. By disguising themselves as their servants, Sylvia and Doronte try to profit from the system. Ironically, their disguises only reinforce what they want to knock down. Sylvia disguises herself to see Doronte as he truly is, but Doronte isn’t who he truly is. Le jeu de l’amour et du hasard is the play you return to time and time again because of its brilliant construction and universal themes. I look forward to reading more Marivaux soon. I own two other of his plays: Double inconstance and Arlequin poli par l’amour. There are English versions of A Game of Love and Chance available. Lisette : Venons au fait ; m’aimes-tu ? Arlequin : Pardi ! oui. En changeant de nom, tu n’as pas changé de visage, et tu sais bien que nous nous sommes promis fidélité en dépit de toutes les fautes d’orthographe. Lisette: Let’s get to the fact; do you love me? Arlequin: For heaven’s sake! Yes. In changing your name, you have not changed your face, and you know well that we promised fidelity to one another despite all spelling mistakes.